In this crazy world we live in, safety is of the utmost importance to me when I travel. I have to say that when I was in Iceland, I felt very safe. In fact, Iceland has a relatively low crime rate according to the U.S. Department of State. One thing that reassured me of this when I was there was the abundance of baby carriages with babies inside of them outside of restaurants, coffee shops and stores. This is pretty typical in Scandinavia from what I've heard and read. Mothers and fathers will leave their little ones bundled up in their strollers while they go inside a venue to do whatever it is they are going to do. Nobody ever disturbs the carriages, and no one even seems to notice they are even there- except for the occasional American tourist (that would be me) who is not used to seeing such a thing on U.S. soil. I couldn't help but do a double-take the first few times I saw this, and even snapped a picture of this to show to you all. Could you imagine if someone did this in the U.S.? They would probably be arrested and have their baby taken away from them! It's nice to jet set to a place these days where you can feel so safe. 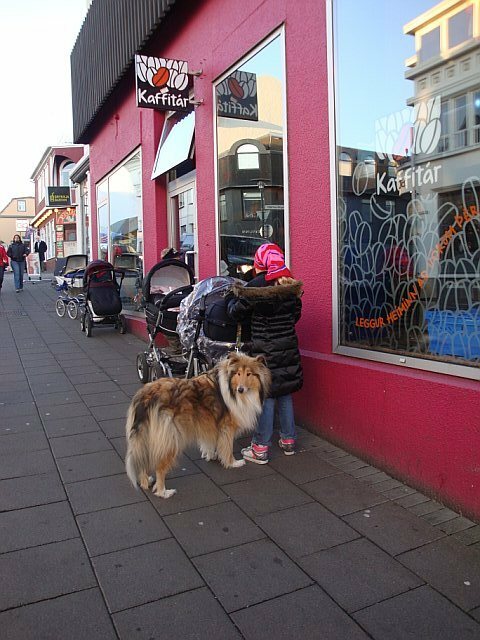 Labels: baby carriages, iceland, Iceland equals Safeland, jetsetsmart.com, jetsetsmartblog.com, safety, Scandinavia, smart travel, U.S. It's nice to see that Iceland is such a safe country...definitely would like to travel their with our kids. Thanks for the information!